Return a generalized Hamming window. The generalized Hamming window is constructed by multiplying a rectangular window by one period of a cosine function . Number of points in the output window. If zero or less, an empty array is returned. When True (default), generates a symmetric window, for use in filter design. 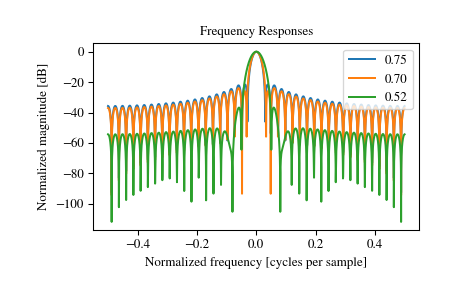 When False, generates a periodic window, for use in spectral analysis. The window, with the maximum value normalized to 1 (though the value 1 does not appear if M is even and sym is True). 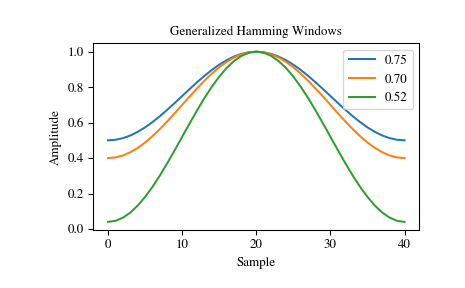 Both the common Hamming window and Hann window are special cases of the generalized Hamming window with \(\alpha\) = 0.54 and \(\alpha\) = 0.5, respectively . The Sentinel-1A/B Instrument Processing Facility uses generalized Hamming windows in the processing of spaceborne Synthetic Aperture Radar (SAR) data . The facility uses various values for the \(\alpha\) parameter based on operating mode of the SAR instrument. Some common \(\alpha\) values include 0.75, 0.7 and 0.52 . As an example, we plot these different windows.